Those who are familiar with Colorado’s history, and even many of those who are not, are very aware that the state’s name came from the Colorado river. Spanish explorers named the river for the silt that colored the river red (colorado means red-colored in Spanish). The fact that the Colorado river was the one feature that was noticed besides the mountains speaks volumes, and goes to show how important Colorado’s waterways were to early settlers, and continues to be important to this very day. Colorado’s river activities are a huge draw for both residents and visitors alike, and you too can take advantage of what these natural features have to offer during your visit to Colorado B&Bs. In the last post, we outlined fly-fishing (link to blog post) opportunities in Colorado’s rivers and streams. But why not consider more physically-involved activities: River rafting and kayaking! The most well-known rivers in Colorado are the Arkansas River and the Colorado River. But Colorado’s numerous waterways span the length and breadth of the state, making waterway fun accessible to every area you may visit! Whether you’re a novice on the water, or an experienced kayaking or rafting daredevil, Colorado rivers offer something for every level of paddler, Class II through Class V.
Class I waters are very gently-moving waters with few surface disturbances and only a few small waves. Danger to paddlers is minimal. This water classification is usually reserved for lakes and ponds. Class II waters are faster-moving with some minor obstacles that are easily-avoided or easily-navigated. Danger is slightly more than minimal. This is the ‘beginner’ paddling class. Class III waters are fast-moving with obstacles which require some maneuvering skills. If paddlers exit the craft, they may require help if they are not strong swimmers. This is the ‘intermediate’ level for rafting. Class IV waters are thrill-rides for most paddlers. Strong waters and currents and dangerous obstructions require skill coordination to maneuver. Paddlers outside the craft are in imminent danger. This is the ‘advanced’ skill-level for rafting. Advanced paddling skills are recommended. Class V waters are Class IVs on steroids: longer durations of continuous obstacles require some serious paddling skills. Paddlers outside the craft are at serious risk. Experts only, please – this is NOT the place to learn! Class VI waters are near unrunnable for most paddlers, and are not offered by outfitters to the general public. Seasonal water flows will influence the water class rating – dependent primarily on snow melt in the high country which feeds the Colorado rivers in late spring and early summer, as well as rainfall. While no one river or stream continuously offers a single water classification, trips can be planned around a central waterway classification, and most Colorado outfitters offer trips of all paddling levels which last from a few hours to an entire day or more. Not sure which outfitter to contact? When you stay at one of the BBIC member bed and breakfast inns, ask your host to make a suggestion or two of the river guides that operate in their town or area. You might even find that your chosen bed and and breakfast has a rafting package available! If you prefer to watch the action on the river, the Arkansas River is home to FIBArk (First in Boating on the Arkansas). Known as “America’s Oldest and Boldest Whitewater Festival,” the event has run rafting and kayaking competitions annually going back to 1949! Salida, Colorado is home to this event, and 2012 will mark the event’s 64th Anniversary. FIBArk is rich in history, excitement, and fun for the participant and spectator alike – don’t miss the Hooligan Race on Saturday June 16th – this is is a huge crowd-pleaser! So if you are looking for a bit of outdoor fun during your stay at one of our Bed and Breakfast Innkeepers of Colorado member inns, why not spend some time on the nearest Colorado waterway? You’ll enjoy the ride! 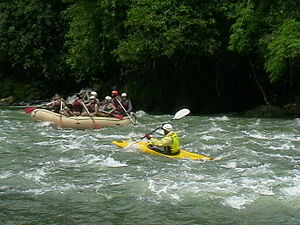 This entry was posted in Uncategorized and tagged Kayaking, Rafting, River Activities by admin. Bookmark the permalink.